These six Bible-studies open up Zechariah's reassuring and revitalizing message for God's discouraged people. Christians struggle. We struggle with ridicule and being ignored in a ‘day of small things’; with opposition to the message that Jesus is the only way to God; with our own failures and the devil’s accusations that make us question whether God accepts us. False teachers, false religion, and false priorities plague and distract us. In Zechariah’s day, Israel had returned from exile, but home was certainly not all they had hoped for. Zechariah’s task was to bring comforting words to the struggling people of God. These six Bible-studies open up Zechariah’s reassuring and revitalising message for God’s discouraged people, including God’s great international building project; His solution to sin; His promised Shepherd-King; His great Day of judgement and salvation. Constantly focusing on what these things mean practically for Christians today, this course aims to help Christians live a life shaped, not by ‘these days’, but by ‘that day’ when God’s big plan comes to glorious fruition. Study was used for family devotions. 1) Poor Biblical Theology - often times the author jumps from Zechariah to direct application without any consideration of the differences between audiences (us vs. Jewish audience) and how they relate to each other. This undermines the application of the text, and often is really just pasting a thinly related NT passage on top as application. 2) Eisegetical - on a number of occasions we found the study pushed meaning into Zechariah in order to then apply it. 3) Induced rather than inductive - at critical points the author tends towards asserting a point rather than helping you understand the connection. Readers are left to figure out how the author made the connection. Sometimes unsuccessfully. Overall it felt like the author had decided on his topic (comfort for struggling Christians) and then used a large hammer to fit the Zechariah shaped brick through the applicational hole. We'll be avoiding the other OT Studies in the series. 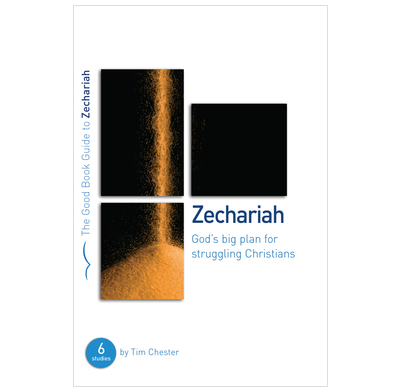 Used by our home group - none of us had studied Zechariah in any depth before. Therefore challenging, but notes were helpful and sound. Members were asked to read and study beforehand. We use this book for our homegroups and it is great. We only cover 1/2 of a study in one evening, so this lasts us for 12 weeks. Zechariah is a great book to study anyway (don't you just love Zehariah 3), but occasionally someone has not had time to go through the study beforehand and they struggle. The questions are at a good level, not simply regurgitating the passage, but generally not too woolly either. The study always tries to make the passage relevant to the 21st century. I would have given it a score of 4.5 but when studying chapter 3 (of Zerchariah, study 2) I did need to ask some further questions to really get to the heart of the passage. All in all an excellent study guide, but I feel it really does need all the group to study the passage beforehand. This may be more to do with the book of Zechariah itself than the study guide. We are studying this in our ladies bible study group and found the studies of the visions very challenging. Trying to get our heads round the visions and make sense of them for today was difficult. The last few studies have proved to be deeply challenging as we seek to understand the true nature of holiness and becoming the people God desires us to be. Thank you so much for an excellent study guide that keeps us in the word and challenges us to walk in the light of it. The study was used for a small study group and we found it very challenging. The format of the book was very good and the questions were very relevant for Christians today. The leader's guide at the back of the book was also very helpful for those meatier questions. We look forward to studying another book from this series.